The key to evolution in human history was the ability to co-operate and act as a group. In this world today, where the contemporary individual spends almost more time in the solitude of virtual worlds than in real, physical interaction, new challenges arise. What will happen to our society if we isolate ourselves between the walls of our individualism? Gyula believes that it is essentially important to remind ourselves how every single one of us is part of a community, a group. By creating a safe, cozy environment, using the universal language of rhythm – to which every living being can relate – THE BRIDGE aims to tear down the barrier between the performer and the spectator. And through the unique, physical experience of the power of dancing together in the same beat, it offers a slight shift of consciousness – to perceive how the individuals are part of a community at the same time. THE BRIDGE is a contemporary dance ritual. 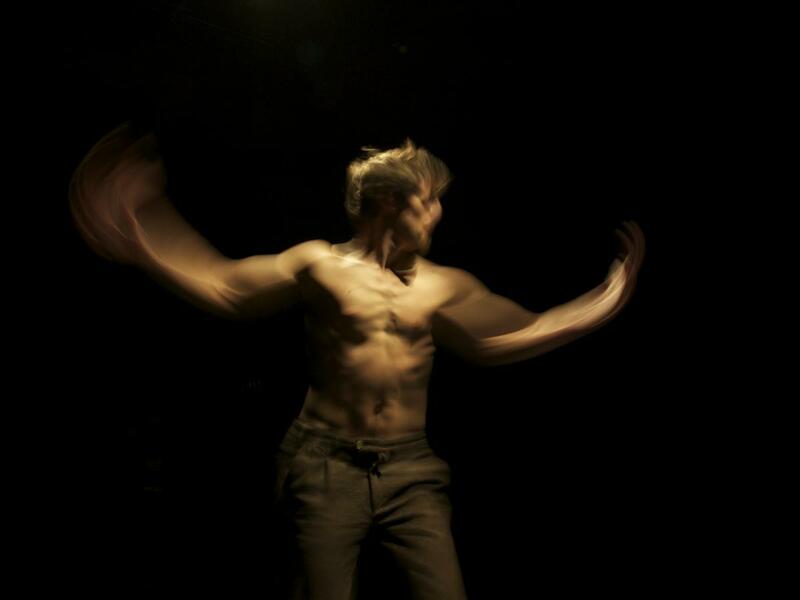 Using the power of rhythm and movement, it pulls the audience gradually towards the present moment, the here and now. By doing this it creates a link, a connection between the past and the future, between the different individuals who take part in this interdisciplinary ritual. Through time, as the participants are taken – unconsciously – closer and closer to the state of trance, one might forget about his problems, worries, issues, etc. In the final catharsis, all that stays is sweat and smiles, while the grey clouds of our everyday-like troubles fade for a while, leaving a well-needed and well-deserved “carte blanche” in our minds. The genuine strength of this performance is in it’s simplicity: it could be performed almost anywhere, both in- and outdoors. Using a simple, traditional, wooden flute and body-percussion, it creates a space, open enough that people all over the planet – regardless of their cultural, political or religious background – could relate to. Being simple, it allows the participation to everyone who are able to move. In our world of growing exclusivity, THE BRIDGE wants to be inclusive. In the middle of globalization, it would like to be universal. THE BRIDGE wants to return the pleasure of dancing – to everyone.